Preferences for trends, graphing, and a few other things have always been site-specific, but most customers want them to be the exact same for all of their sites. There's also the (large number of) people who have sub-user accounts who are at the mercy of the master account as to how these preferences are set. 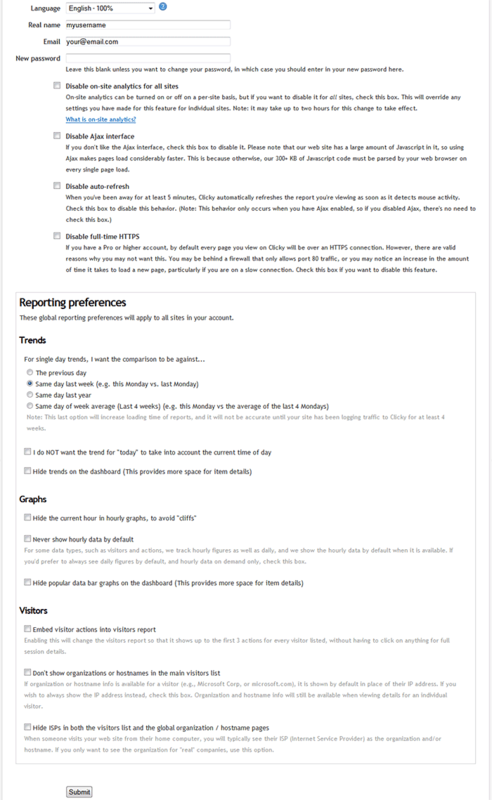 We've gutted this mess and moved these preferences into the global user preferences page. Now every user has control over exactly how they want all of these settings to work. A screenshot of the new page is below. The site preferences area is now all related to tracking preferences, which makes more sense. The dashboard preferences are now just for the layout of the modules, and the settings of each one (e.g. which tab is the default). We also added a few new features that have been requested fairly often: A site preference to allow the logging of all bot activity, and a user preference for hiding the current hour in hourly graphs, to avoid panic when seeing a 'cliff' near the beginning of the hour. These are covered in more detail in this post. ?????? The most important thing for me is to see pageviews and on my dashboard, what I had over the last 7 days, per day and current. That has now disappeared!!!!! All I have i a graph!!! Useless to me!! !